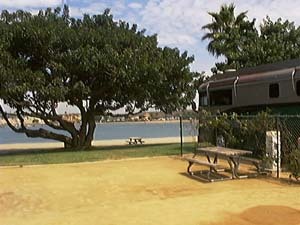 It was with a bit of mixed feelings that we approached the famous Newport Dunes Waterfront RV Resort. On the one hand, it is touted as the "Ritz of RV parks" (by the Los Angeles Times), which arouses curiosity; on the other hand, "$95 a night".... seems outrageous. Especially for us, since some of the best experiences we've had have been in free camps. 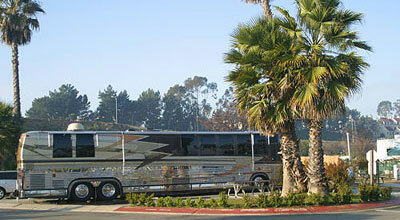 As we drive through Newport, (45 minutes south of the Los Angeles Airport) we are already immersed in luxury. Roads wide enough for a 37 footer to make a U-turn in one move; upscale, gated condo-communities set the mood. Memories of a visit to some of the best shopping in the world, at Fashion Island and South Coast Plaza already seem worth the price of admission. 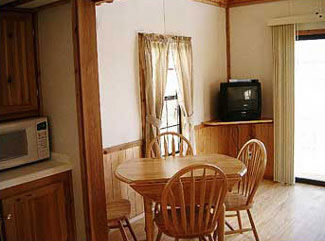 Accommodations are provided for 394 RV Sites and 12 Cottages, with state-of-the-art facilities. 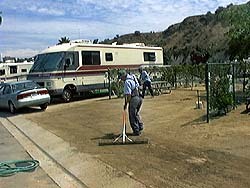 In the background, you can see the marina where 430 slips and the only boat launch in Newport is available to RVers and the public. The reception area of the resort is a pleasing mediterranean-style bungalow, part of the six-building Village Center. Half-a-dozen enthusiastic, uniformed staff are available to check you in. The resort Village Center includes a swimming pool, spa, convenience store, recreation rooms, laundry facilities, as well as conference and meeting rooms. Galleries, restaurants antique shops and boutiques are within walking distance. A double-wide, fenced in, waterfront space on the broad sandy beach along upper Newport Bay. Sizes range from 22' by 25' for tent sites to 25' by 45' on the waterfront . at the Ritz of RV Parks. And here, golden sunsets and evening sea breezes are your bonus. e hook-ups for 50 cents a day are among the resort's amenities. When fully staffed, 150 people work at the Resort. 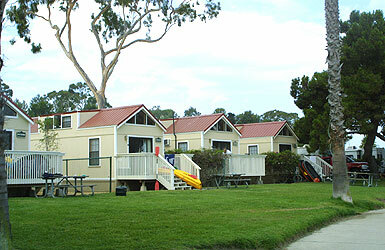 Up to six people are allowed to stay in one site. 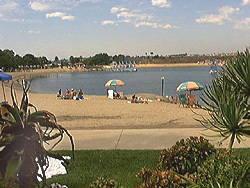 During the summer months, occupancy is 95%. 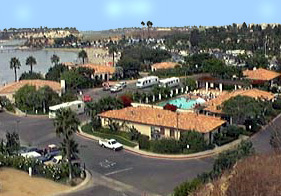 The Newport Dunes first opened in 1958 and the architect's firm who designed the camp is the same one who designed the Ritz Carlton in Dana Point and the Four Season Hotel in Newport Beach. Lynn, 11, from Newport,is here for the second time and brought her own monocycle. You can choose to rent sailboats, kayaks, pedal boats, sail boards, bicycles, roller skates.... and more. Pavilions and cabanas along the beach can be rented for parties in 5-hour increments by RVers and/or the public. Or, you can relax and lie on the beach. A personal, countryclub-like atmosphere prevails. Even with a full camp, you never have the feeling of being crowded. There is always someone around to give you personal attention: a security guard, an activity director, a member of the staff. There's a sense of community. 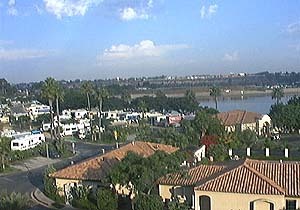 Newport Dunes is a "destination camp", as opposed to a stopover, and different from say a KOA resort by its luxury, the natural setting and the personal attention given adults and children alike. Although the "$135" a night does apply (highest waterfront/large site/holiday rate), there are alternatives. Right now for instance is a good time to plan a visit to the Dunes. Come September 1st, "winter rates" apply. May we ask you to fill this short form?